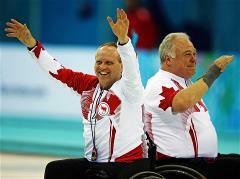 In the Wheelchair Curling final, the Canadians overcame Russia and won their third consecutive Paralympic gold. The Russian Wheelchair curling team has secured a place in the final after winning its match against Great Britain 13-4. Today’s final session of the round-robin stage of Wheelchair Curling has decided the final two semi-finalists of the tournament. Matches in the 11th session of the Wheelchair Curling round robin tournament have now concluded.